BFSL (Big Fine Summer Launch) 2018! Chris’ Rocketry Supplies On Site! Order Motors for “NRVR Summer Launch” Delivery Now! 1) Either RSVP to our facebook event, or clubs please email officers(at)nrvr.org so that we can get an accurate headcount for HP parking and food! Ceiling: 10,000’ standing FAA waiver. 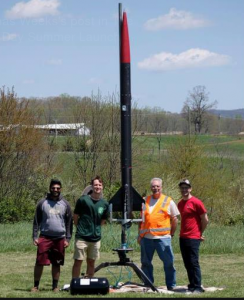 Please inform officers(at)nrvr.org for approval for certification flights/exams, before flying anything over 6,000, or any complex/research rockets. $10/day Launch Fee: NRVR charges $10 HP launch fees, but volunteer to help with RSO/LCO or HP pad duties and get $5 back! We take cash or check at the launch. Email officers(at)nrvr.org to reserve a volunteer slot and get your discount! Pads: Plenty of pads, 1010, 1515 rails and unistrut mounts to accommodate low, mid, and high power rockets all the way up to M-impulse. Chris from Chris’ Rocketry Supplies will be on-site all weekend. But Get your orders in ASAP! Allow 1 month lead time for anything over 54mm! 2) For larger or >54mm motors, order before June 29th! Food: THE ROCKET GRILL RETURNS!! !